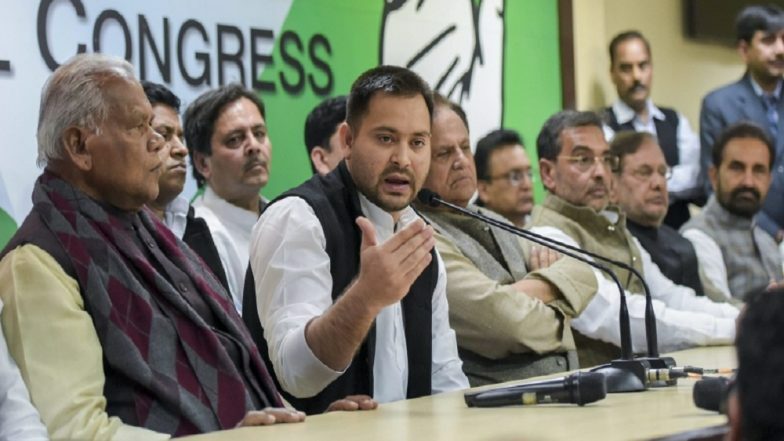 Patna, March 22: The Mahagathbandhan headed by the RJD-Congress combine released their Bihar seat-sharing pact for the upcoming Lok Sabha elections 2019. As per the agreement finalised by the six member coalition, the Rashtriya Janata Dal (RJD) would take the lion's share of 20 seats. Of the remaining constituencies, the Hindustan Awami Morcha (HAM) would be contesting on 3 seats, the Vikassheel Insaf Party (VIP) of Mukesh Sahni would also be fighting on three constituencies, whereas, the CPI (Marxist-Leninist) would be contesting 1 constituency on the RJD ticket. Apart from the parliamentary constituencies, the Mahagathbandhan has also released the list of candidates for the two assembly by polls. Dhirendra Kumar Singh alias Munna will be contesting from Nawada, whereas, Mohammad Firoz Hussain will be fielded from Dehri. Meanwhile, the BJP-led NDA is yet to release the list of candidates for the Lok Sabha elections 2019 in Bihar. The coalition, however, had finalised its seat-sharing agreement back in January. The BJP and the JD(U) are contesting on 17 seats each, whereas, the LJP will be fielding its candidates from the remaining 6 constituencies.